For the past week or so I was puzzled as to why the blog I posted "Dallas Activists: Time to close disrespectful businesses and create Do for Self opportunity in Black neighborhoods" at the top of the year started getting heavy traffic and more comments all of a sudden. According to The Final Call, "The spark that ignited the effort and spawned a united front among religious, community and political leaders was an early December incident involving Jeffery Muhammad, the Dallas representative of the Nation of Islam. The student minister of Muhammad Mosque No. 48 said he was told “go back to Africa,” called a “monkey,” “slave,” and a “broke a-- n----r by an Asian gas store owner, following a confrontation that began with questions about minimum purchase requirements imposed by the station owner." The Don't Stop Don't Shop protest has exceeded 40 days of action in front of the business. It has now jumped the ocean. My original blog link has been reposted on this foreign site and according to a report in the Korean Herald "The Foreign Ministry sent Cho Yoon-soo, the consul general in Houston, to Dallas to find facts and discuss countermeasures with Korean community leaders." stop responding to hate with hate. I don't see the need to get rid of the store owner? If local customers are not happy with the service then they should go somewhere else!!! There is no need to discriminate. Martin Luther King would not be happy to see people hating one another based on their ethnicity. Protesting MUST stop. Leave the shop owner alone! FINALLY STANDING UP WE DONOT HAVE TO SPEND OUR MONEY AND BE DISREPECTED AT THE SAME TIME. So if the store ower was African American and was disrespecting you, then you would have the same outrage, right? The only difference : Race. Isn't this the very definition of racism? "not just the Koreans but Arabs, Chinese, etc." If you really want to end racism, stop using racism to attack racists. If you don't like the store (for any reason, including the accusation of selling bad products at high prices), simply shop elsewhere. Of course, if these accusations were true, he would have gone out of business a long time ago. Since he has owned the business for over 10 years, I'd say that the prices and products are not the issue here. Do you think that a black shop owner would sell gas at 25 cents per gallon and sodas for a dime? It is interesting that you have picked a gas station that must leave your neighborhood but the two drug house there are just fine. Also, I can't help but notice that you are pointing out the guy's race in your twitter posts. I wonder if he was black or muslim, would you be so descriptive? Please stop this madness before someone gets hurt. The Black community should run these hateful and disrespectful people out of the Black community all accross America and not just the Koreans but Arabs, Chinese, etc who continue to treat Black people with racist attitudes and gross disrespect. The Black community don't need foreign racist doing business in are neighborhoods and selling us bad products with high prices. LEAVE ARE COMMUNITY NOW! I just have to laugh at the hyporcacy and childish English. 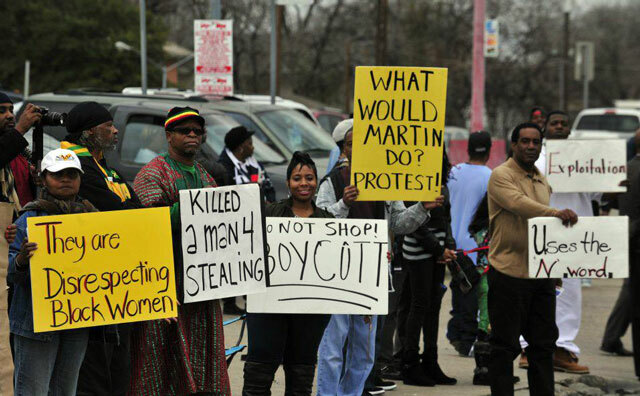 There are no stores in "Black" neighborhoods because they have been robbed or beaten out of business. Loved the comment about the drug houses being OK in the hood. I'm going to make a special trip from Irving to support this store.